Elkader is an ARTSY hip town in northeast Iowa that's just a skip away from St Olaf. In fact, it's one of the reasons I was excited to move to this beautiful little corner of the world. There's an eclectic mix of restaurants, bars, boutiques, a digital projection cinema, a community swimming pool, amazing parks, the historic Opera House, and more! There are also all of the other amenities families need like grocery, pharmacy, hardware, an excellent school, etc. It's truly a charming area and we've had a blast getting to know the community since we moved here five years ago! I have especially loved watching the support of the arts in northeast Iowa grow each year, and I'm not alone. We've recently welcomed many other amazing couples back to northeast Iowa; one of them is Steve and Sally Stendel. Steve and Sally moved to Elkader and opened not just any store...they've opened G's Closet and GALLERY! Yes, you read that right! Elkader has a new art gallery and I am so honored to get to showcase my artwork in this beautiful space. When Steve wanted to move back full-time to his hometown of Elkader, he asked Sally what it would take. Wanting to be involved in the community and loving the support she saw first-hand for the arts in our area at Art in the Park, she wanted to open a gallery! (I use a lot of exclamation marks when I'm writing about art and galleries, because they make me so happy!) Sally and Steve also felt there was a market for young women's and girls' clothing and so they decided to create a space that offered both. The next thing they had to figure out was where and what they would call it. Since their grandkids had such an influence on their shop and have always called Sally "G" (since they couldn't quite pronounce grandma when they were little), G's Closet and Gallery was born! They moved into what was once Willow Creek, where I used to showcase my artwork, and they did quite a bit of renovation and rearranging to make a beautiful new gallery space, dressing rooms, a kids zone (God bless you), and storefront! Seeing the transformation was so exciting and I could hardly believe that I would get to show my art in this beautiful setting once again and along with so many other talented northeast Iowa artists! you'll feel right at home trying on clothes in their beautiful dressing rooms, and relaxing with a cup of coffee in the gallery. It's bright, airy, clean, and the clothes are ADORABLE! they've shopped the best sales and are passing them on to you! I can't even get over this adorable Kids Zone, Emmajean runs immediately for the crayons and coloring book every time we step foot in the door! Below, artist Bev Hamann shows off her mosaic work to a friend as they have fun browsing the gallery. I'm grateful to Steve and Sally for offering such a refined gallery space for northeast Iowa, and for offering a fun mix of adorable affordable name-brand clothes, shoes, and jewelry, too! 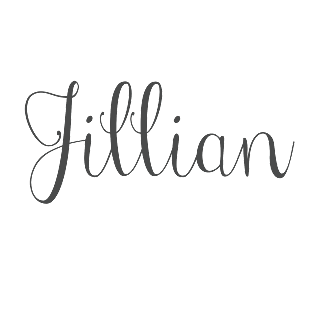 If you haven't yet, I highly encourage you to check it out! 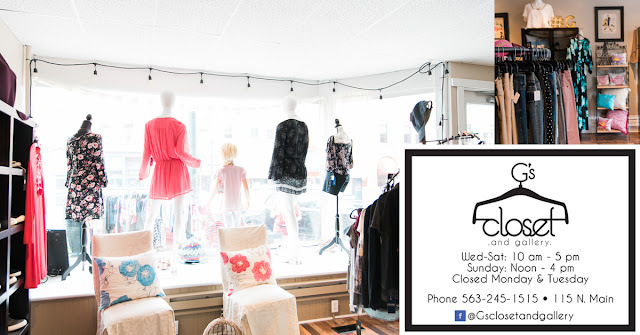 You're going to love G's Closet and Gallery and the gals that run the place, too! 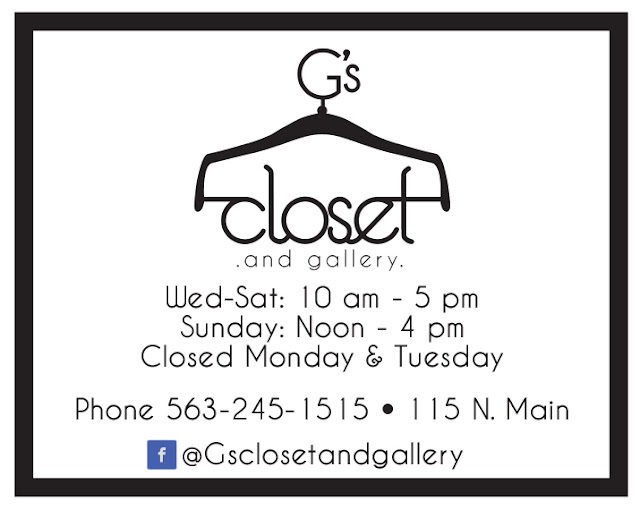 The Grand Opening for G's Closet and Gallery was just a couple of weeks ago, so be sure to stop in and say hi! 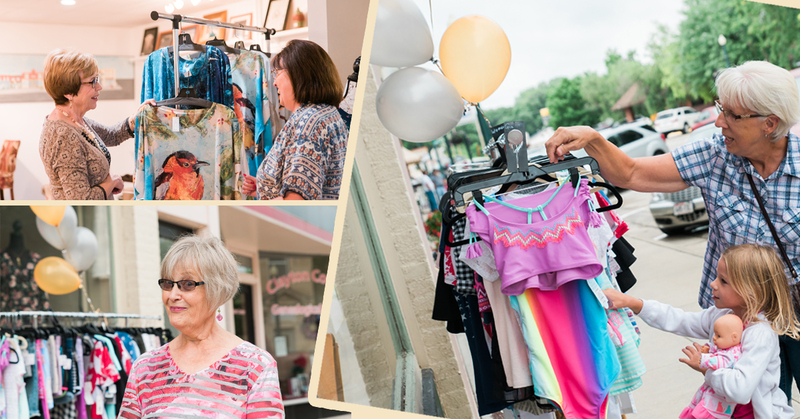 Sally (top left) helps a customer inside the gallery while Nancy (bottom left) helps assist customers outside during Elkader's Sidewalk Sales and G's Closet and Gallery's Grand Opening! 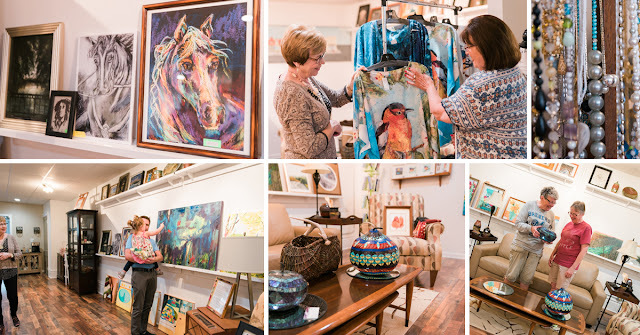 Sally and Steve have truly created a special place to shop, visit, and relax in Elkader. 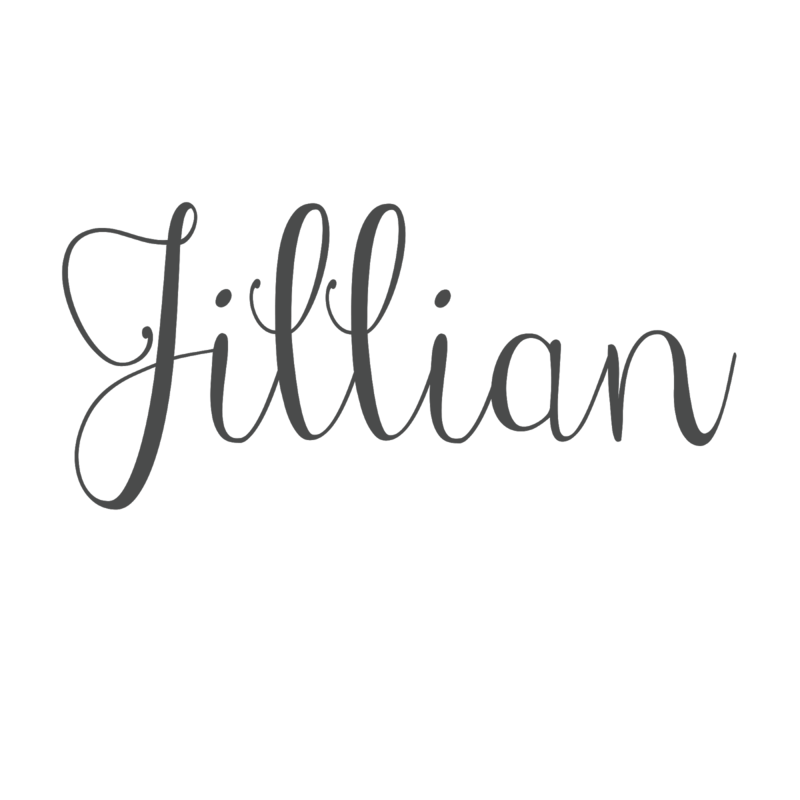 They've shown their support of the arts in so many ways and have even pitched in as a patron level sponsor for Art in the Park 2018 and we are so grateful to have them, their support, and their vision in our community! Any J.Webb Fine Art at G's Closet and Gallery will be 15% off during the festival -- but be sure to come down and see more at Art in the Park- August 18th and 19th! Come find me JWEBB FINE ART at Art in the Park! 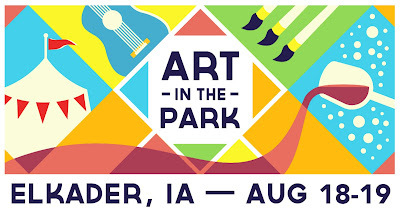 I'm one of the 60 Artists at Art in the Park in Founders' Park, Elkader, IA, this weekend August 18th (10-5pm) and 19th (10-4pm), 2018!